One good wish changes nothing. But one good decision changes everything. Your power to choose, to make a good decision, spells the difference between wishing and making real life changes. She found herself thinking of how it would feel to be safely trapped in his arms, with no more possibility to choose. It's good to let God pick a man for you. We don't do so well when we pick them ourselves. They end up lipsticks in a drawer, all those wrong colors you thought looked so good in the package. It’s an act of our will to choose to see people simply as wildly loved by God, to assume their beauty before guessing their depravity. When you choose to work with a willing, happy heart, you become a beautiful source of joy to all. In spite of being complicated people choose superstitions over common sense. Don't let anyone take your power by influencing what you do.... sure ask for advice when you are still deciding, but once you are sure what you want to go for, don't let anyone deflect you. It is YOUR choice to make and to follow through. Choose your words carefully. They reveal your inner character. I had the privilege of being able to choose, or at least have the opportunity to work at, being anything but an actor. Our true nature is one of innocence and freedom to choose how we live. We need to be brave enough not to give that away. Don't give up on your right to, and sense of, TRUTH, Justice, and GRACE. Part of being of a true existentialist is wanting to be what we make ourselves be by the way we choose to act, as opposed to making excuses for the way we act and regretting it. Words are life. Carefully choose your words. 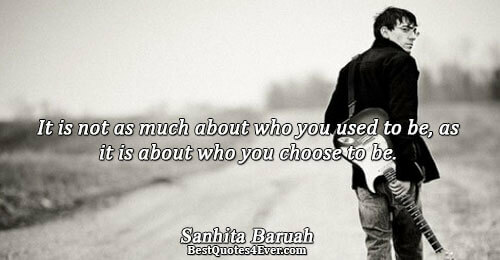 It is not as much about who you used to be, as it is about who you choose to be. Greatness comes from the inside and once you believe you have it, it's yours to share with the world. We should not influence our children to such a belief or religion. We should just show them the path of goodness; and from that, they can choose according to their interests. You have to choose your own destiny. You have to choose your own path in life. The choice to make good choices is the best choice you can choose. Fail to make that choice and on most choices you will lose. And that’s the truth I needed to swallow: people don’t step out and love for you; that’s on you. You have to be the one to get down deep enough and whisper the words people can’t always say for you - whether you believe in them full or not - “I choose you. I choose you.